Here you can see the large minaret of this mosque. 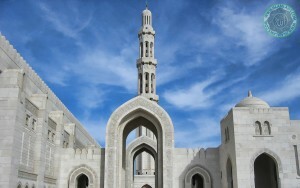 Sultan Qaboos Grand Mosque is the largest mosque in Oman. It is the grand mosque of country which was built by Sultan Qaboos. Here in this photo gallery we have designed some wallpapers of this mosque for you.